What Leaves You Wonder Struck? Wednesday night I returned from one of the most memorable trips I’ve ever taken in my life. I spent the week in Ft. Myers, Florida with my best friend (closer than twin sisters my husband says) and her husband. They moved into their new home the night before I arrived, so you can imagine the chaos of boxes and furniture that greeted me! Unbelievably, my hosts had arranged for the guest room to be ready, and I slept in comfort and peace with gentle, balmy breezes soothing my travel weary body. What couldn’t be imagined was the view that presented itself upon my rising the next morning. From the front door (adjacent to my room), through the entire length of the house and out the wall sized triple sliding glass door, I beheld the most marvelous view of their lanai, pool and the lake beyond—in that order. The lake is actually a “pond” (I was informed), but to use the word pond conjures an image that can’t do justice to the scope of beauty it offers. We spent many hours relishing that view. The lake panorama was only the beginning. Three days later we strolled along Lover’s Key Beach searching for shells and exalting in the ocean scenery. 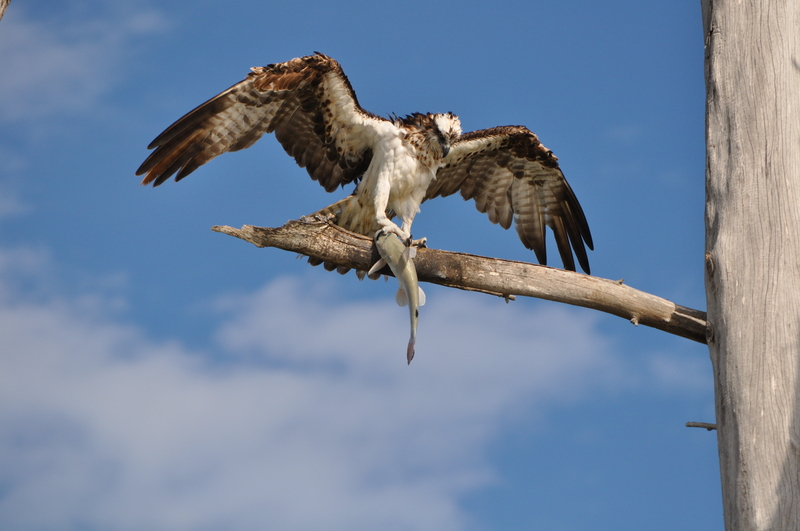 We had spied osprey (also called sea hawks) diving into the river a half mile up from the beach, and now I noticed one swoop overhead and land in a nest atop a driftwood looking tree. My interest was piqued, and I proceeded to take various camera shots of the surrounding trees supporting a scarce osprey. Suddenly, one of the black and white feathered sea hawks soared across my lens and landed with glorious wings outstretched and dripping with river water. In his right talons, he gripped what appeared to be a catfish struggling for release. My heart raced, and I tip toed closer to the tree where he perched, holding my breath and marveling at a sight one would only see on Animal Planet. I confess I shed a few tears of awe. 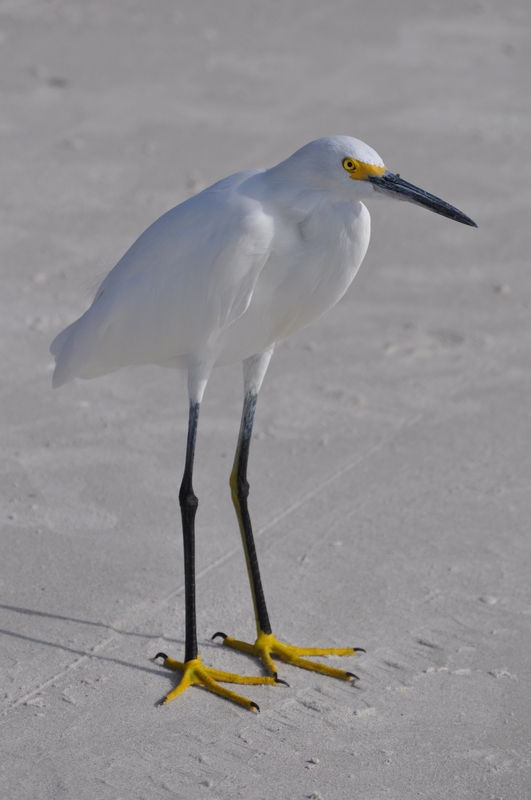 The day held more wonders of God’s creation: a yellow footed heron, a horseshoe crab, a blue heron, giant pelicans, the largest hermit crab I’ve ever seen, and sea gulls with black and white polka-dotted tails. 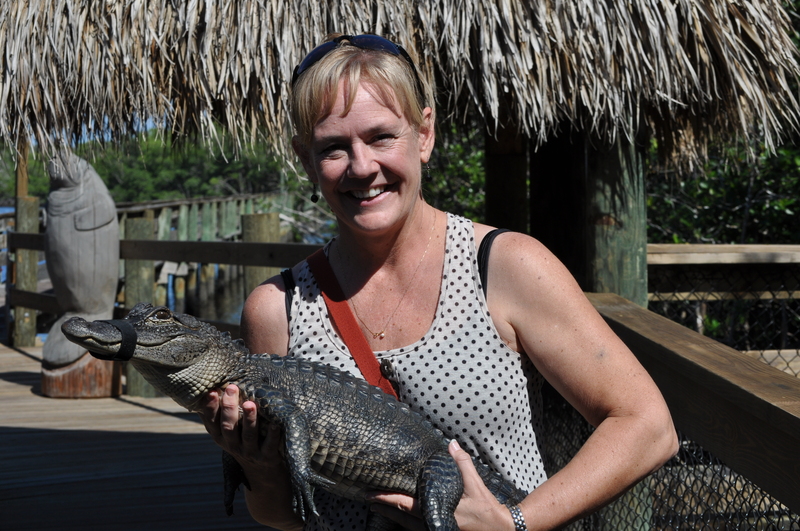 A few days later I held an alligator. 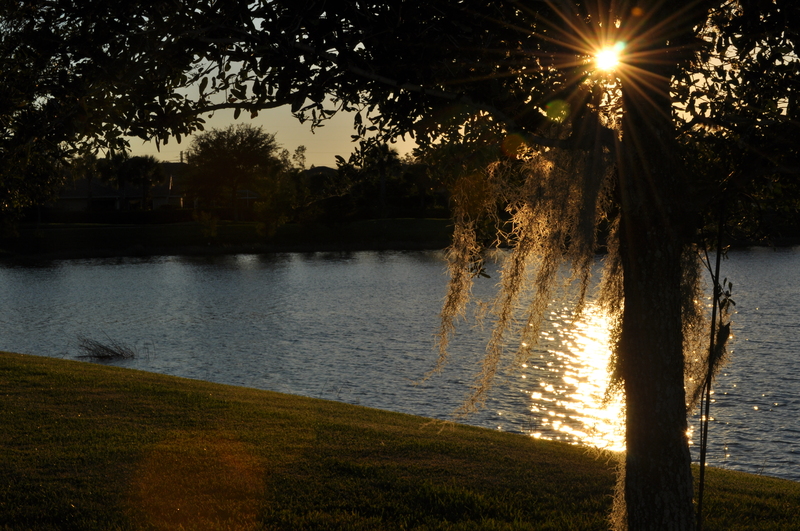 My week in Florida left me struck with wonder at every turn. Stunning sunsets, tunnels of mangrove trees, manatee sightings and all I’ve described set a stage for God’s creative majesty. But the gracious love of my friends and the way they felt helped and blessed by my presence left me speechless. I was simply being myself, and me being me enhanced their lives. Now THAT is an amazing God! What does all this have to do with writing?? Aware of the privilege of watching God’s creation unfold its glorious mysteries, I didn’t want to miss a millisecond. Wonderstruck by my Creator, this moment of spiritual awakening stirred in me a longing to experience more of God. I couldn’t have put it better. This passage describes my trip of wonders, and my desire to revel in the wonder of my God. I am in awe and my heart can only bow on its face in adoration. Perhaps you’ve experienced the same. You may want to consider checking out Margaret’s new book which I believe will lead you to greater depths of wonder in your spiritual life. Even today, I pray you are struck with wonder by God and his majesty. What leaves you wonderstruck? Have you read any of Margaret’s books or heard her speak? All photographs used on laurasconfessions.com were taken by and are the property of Laura Bennet. Please do not use them without permission. Thank you. What Does a Real Writer Write?